(1961) Debra Paget, Robert Alda. 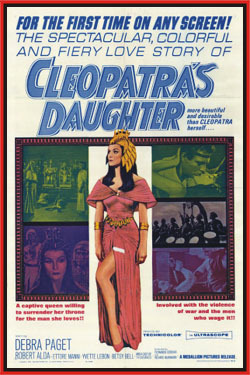 Paget looks sensational in this well-made thriller about the daughter of Cleopatra. Her husband, the Pharaoh of Egypt dies very mysteriously, after which she's sentenced to be buried alive in his tomb! Will she be saved in time? Not bad at all. Color, from 16mm.